Bioengineering graduate student Michael Hu and undergraduate student Xin Yi (Linda) Lei construct a vascularized gut model using their team's new 3D bioprinting technique. Photo: UC San Diego Jacobs School of Engineering. Bioengineers at the University of California (UC) San Diego have developed a 3D bioprinting technique that works with natural materials and is easy to use, allowing researchers of varying levels of technical expertise to produce lifelike organ tissue models. As a proof of concept, the UC San Diego team used their method to create blood vessel networks capable of keeping a breast cancer tumor alive outside the body. They also created a model of a vascularized human gut. They report their work in a paper in Advanced Healthcare Materials. The goal isn't to make artificial organs that can be implanted in the body, the researchers said, but to make easy-to-grow human organ models that can be studied outside the body or used for pharmaceutical drug screening. "We want to make it easier for everyday scientists – who may not have the specialization required for other 3D printing techniques – to make 3D models of whatever human tissues they're studying," said first author Michael Hu, a bioengineering PhD student at the UC San Diego Jacobs School of Engineering. "The models would be more advanced than standard 2D or 3D cell cultures, and more relevant to humans when it comes to testing new drugs, which is currently done on animal models." "You don't need anything complicated to adopt this into your lab," said Prashant Mali, a bioengineering professor at the UC San Diego Jacobs School of Engineering and the paper's senior author. "Our hope is that multiple labs will be able to work with this and experiment with this. The more it gets adopted, the more impact it could have." The method is simple. To make a living blood vessel network, for example, the researchers first digitally design a scaffold using Autodesk. Then, with a commercial 3D printer, they print the scaffold out of a water-soluble material called polyvinyl alcohol. They pour a thick coating – made of natural materials – over this scaffold, let it cure and solidify, and then flush out the scaffold material inside to create hollow blood vessel channels. Next, they coat the insides of the channels with endothelial cells, which are the cells that line the insides of blood vessels. The last step is to flow cell culture media through the vessels to keep the cells alive and growing. 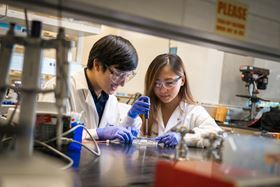 Finding the right materials was one of the biggest challenges, said bioengineering undergraduate student Xin Yi (Linda) Lei, a co-author on the paper. "We wanted to use materials that were natural rather than synthetic, so we could make something as close to what's in the body as possible. They also needed to be able to work with our 3D printing method." In one set of experiments, the researchers used the printed blood vessels to keep breast cancer tumor tissues alive outside the body. They extracted pieces of tumors from mice and then embedded some of the pieces in the printed blood vessel networks. Other pieces were kept in a standard 3D cell culture. After three weeks, the tumor tissues encapsulated in the blood vessel prints had stayed alive, whereas those in the standard 3D cell culture had mostly died off. "Our hope is that we can apply our system to make tumor models that can be used to test anti-cancer drugs outside the body," said Hu, who is particularly interested in studying breast cancer tumor models. "Breast cancer is one of the most common cancers – it has one of the largest portions of research dedicated to it and one of the largest panels of pharmaceuticals being developed for it. So any models we can make would be useful to more people." In another set of experiments, the researchers created a vascularized gut model. The structure consisted of two channels: one was a straight tube lined with intestinal epithelial cells to mimic the gut, while the other was a blood vessel channel (lined with endothelial cells) that spiraled around the gut channel. The aim was to recreate a gut surrounded by a blood vessel network. Each channel was then fed with media optimized for its cells. Within two weeks, the two channels had started taking on more lifelike morphologies. For example, the gut channel had started to sprout villi, which are the tiny finger-like projections lining the inside of the intestinal wall. This story is adapted from material from the University of California San Diego, with editorial changes made by Materials Today. The views expressed in this article do not necessarily represent those of Elsevier. Link to original source.